It may seem a little subdued at the start, but there are some very scary moments in the opening part of the game. 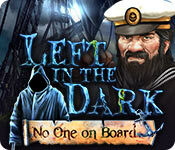 This game starts out with a classic mystery: the abandoned ship with all crew mysteriously gone. The introduction to our story includes cut scenes that are beautifully drawn, and I love the ‘ghostly’ ship. We are a detective who has received a letter from the mayor of Portsmouth, where the ship first set to sea, and then returned some weeks later. He and the harbourmaster have little to offer by way of assistance, so, lantern in hand, you board the strange vessel and begin an inspection. Things go pretty much downhill from there. The graphics are a delight, top quality and hand drawn, but with a rougher touch which makes them significantly different from the ‘pretty’ art of fantasy games, but nowhere near as dark and dreary as other thrillers. There is a mistiness about many of the scenes, giving it a ghostly ambience while not interfering at all with the clarity of the scenes. The music is just okay, but the ambient sounds are good, and the voiceovers are excellent. You can adjust sounds, music, voice dubbing. You can also adjust for aspect ratio. There is a lot to do in every location, and there are a lot of locations (15 in the demo alone). The gameplay is old-fashioned these days, with only interactive lists for the HOs and well known easy puzzles. I really like that when you revisit a HO scene, the items you removed before are still gone. Hint is directional and has an almost instantaneous refill, as does skip. The interactive jump map can be adjusted to show active areas or not, by the choice you make of 3 difficulty levels. Even on the lowest level, the sparkles are discreet except for the HO scenes. At first I thought this was going to be mostly a HO game, but it actually has a lot of adventure tasks and objectives as well, and even the puzzles are fairly frequent, but I can’t pretend that I didn’t find it very easy. I enjoy easy if the story is fun, and this one definitely has me. The action is logical but not linear, and I am intrigued... How will this story end up being what the ad blurb on this game’s web page describes it? There is a mere breath of a hint in the last moments of the demo. Have you noticed these things seem to go in waves (excuse the unavoidable pun)? We’ve been having a lot of maritime adventures lately! Luckily I like a good swashbuckler, so I’m diving right in! Before we get started, be aware that there are both snakes and spiders in this title, so if you're squeamish, you might want to try the demo before purchasing this one. Options include separate sliders for Music and Sound, Custom Cursor, Windowed and Subtitles (ON by default.) Three choices for difficulty, but if you want all of the achievements, you'll have to play on Expert, use no hints during HOS, and no Skips on puzzles. We have an interactive jump-to map, though active areas will not be indicated if you're playing on Expert. This is one of the rare titles that could have been truly frightening, but as usual for casual games, the fear factor is played down by the tone of voice our main character uses. That is not to say that she didn't do a good job -- as a matter of fact, she showed more alarm that you usually see in hidden object games -- but I find myself wishing that the devs would allow some actual FEAR to creep into their actors' voices. Still, this one is perhaps too scary for the younger crowd. I had figured out the game's biggest mystery by the time I was half way through, but I still enjoyed playing it through to the end. Early Hidden Object Scenes are interactive, but that doesn't last for long. Once you get going into the game, all of the objects are spotted and selectable without having to do any actions first. Most -- but not all - HOS will be used twice, and if you're playing on Expert mode, the misclick penalty is obnoxious. Speaking of obnoxious there are 13 in-game/Steam achievements, and each time you obtain one, there is a pop-up that takes up fully 1/4 of your screen. Completely immersion-breaking. HINT: There are two achievements that would require you to replay the game if you don't do them correctly, so if you're not absolutely sure that you're following the map the right way, check a walkthrough! Graphics are mostly very nicely done, with the occasional weak, unfinished-looking scene. Happily, there are only a few of those in the game. Left in the Dark: No One on Board is definitely a title that the Dark & Eerie fans will enjoy, and one that I myself had a lot of fun with.